The Economist magazine says the world’s most valuable resource is no longer oil, but data. Today, enterprises across the globe are looking at Data Analytics to derive insights and make good business decisions. Companies understand the value of data and analytics, but still don’t realize its full potential and how it can be used optimally to grow their business. Prashanth will be discussing the four key building blocks to unlocking the value of enterprise analytics. 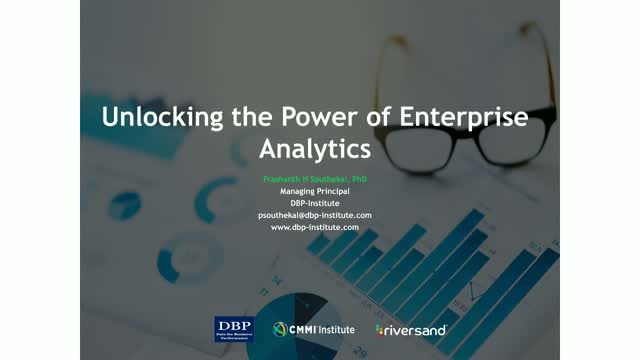 This topic is valuable to specialists, managers, and executives from IT and business functions, looking to get a holistic view on how to leverage data analytics for their business. Maybe it’s their large amount of customer data, or their storefronts as a source of gathering data. Retail is the industry that never sleeps and in the past decade, many legacy retailers have fallen by the wayside in favor of stores with fresh retail concepts: Claire’s has been replaced by BaubleBar, Sears has given way to Amazon, Bon-Ton has given way to HauteLook, and so on. The reality of the current market is that some of these young upstarts understand something that many legacy retailers realizetoo late: advanced personalization initiatives are necessary to stay in the game. It isn’t a coincidence that 45 percent of retailers will use artificial intelligence to improve their operation in 2019. However, simply investing in AI isn’t enough… you need to know how to use it. • What will customers expect from retailers in 2019? • How are new retailers redefining the game? • Which legacy retailers have successfully evolved to meet customer demand? • What advantages do legacy retailers have, and how can they leverage those advantages to compete? • What are retailers’ top challenges to scaling personalization initiatives? • How will master data management (MDM) empower retailers in the years to come? Customer experience (CX) and Master Data Management (MDM) must go hand in hand. Both of these themes involves multiple business units and digital environments within your enterprise and in the wider business ecosystem, where your enterprise operates. To be successful within customer experience in the digital era you need classic master data outcomes as a 360-degree view of customers as well as complete and consistent product information. You also need to combine your customer data and your product data to get to the right level of personalization. Furthermore, you need to able to make sense of internal and external big data sources and relate those to your prospective and existing customers and the products they have an interest in. There is a significant value for consumer-facing brands in direct sales through digital commerce. Join us to learn about factors that influence the digital market opportunity for brands and digital business professionals, including product type, regional differences in digital commerce markets around the world, and the organization’s digital maturity. • Why should branded manufacturers enable direct-to-consumer eCommerce? Join us for the PIM event of the month! In a time of digital transformation and massive market disruption, product information drives the customer experiences that influence buyer behavior. Seit 1479 (richtig) hat sich die Pewag Group zu einem der weltweit führenden Kettenhersteller entwickelt. Heute gründet sich der Erfolg auf ausgereifte Qualitätsprodukte auf dem letzten Stand der Technik. In sechs sehr unterschiedlichen Segmenten, mit verschiedenen Produkten und Marken gibt es komplexe Herausforderungen zu meistern, die sich um viele verschiedene Kanäle im B2B und B2C Commerce drehen, von Direktvertrieb über E-Commerce bis zu Amazon. Dieses Best Practice Webinar handelt davon, wie Prozesse, Mitarbeiter und Tools gemeinsam die Herausforderungen des digitalen Wandels lösen können. Als Basis der digitalen Transformation fungiert die PIM-Plattform (Product Information Management Platform) von Riversand. In recent years a new channel has entered the omnichannel stage. It is called “conversational commerce”. Now is time the conversational commerce comes of age and companies adopt it for their customer engagement strategy. The new paradigm is to own your customer experience. Combining a 360-messaging with a 360 view of your most important data about your customers, products, services, locations and more takes customer experience and agility to the next level. * How to build a (master) data foundation to for the next phase of omnichannel customer experience. Omnichannel ist niemals ausgeschöpft. Jetzt kommt mit „Conversational Commerce“ ein weiterer Kanal dazu und damit die Chance das Customer Engagement noch persönlicher und schneller zu gestalten. Experten sagen dazu „own your customer experience“, an Stelle die aus der Hand zu geben an andere Kanäle oder Anbieter. Die Kombination von einem 360-Messaging mit der 360-Grad-Sicht auf Kunden, Produkte, Services, Locations, Mitarbeiter und viele mehr leutet ein neue Zeitalter in der Customer Experience ein. Business enterprises are increasingly looking at digital technologies and data to be successful in the marketplace. But many organizations are struggling to leverage their digital programs for impactful business performance. In this backdrop, this presentation looks at practical strategies for monetizing business data including a real and practical case study from an Oil and Gas company where master data standards were applied as part of the data monetization strategy for improving the financial supply chain business performance. Doug Lavelle, IT Management Consultant at School Specialty,Inc. As enterprises move towards a unified commerce paradigm, moving products faster and improving customer experience across channels has never been more important. The foundation for your competitive differentiation is not just trusted content, but also delivering relevant information to the micro-segments and gathering insights for improved customer loyalty. A modern PIM (Product Information Management) system is what integrates product content across the purchase lifecycle of a customer. School Specialty Inc. (SSI) has embarked on a customer-focused transformation experience and streamlined internal processes with a modern PIM platform as their foundational elements in aligning digital transformation with business strategies. Retailers and brands today face more challenges than ever before in terms of collecting, normalizing, editing and syndicating consistent product content across channels and partners. The penalties for inaccurate or inconsistent content are severe. The webinar will discuss best practices for using connectors to deliver product content consistency across a network of partners and to drive customer satisfaction and long term profitability. We will examine some of the challenges of synchronizing content with partners and at the connectors from GS1 to product data feeds that help ensure a consistent rich experience for customers across channels. To achieve digital transformation means businesses need to be data driven, insight rich, and intelligently powered. Companies that strategically invested in MDM consistently out perform both digital and non digitally focused organizations. Why? Because MDM brings understanding to the data across a complex hybrid ecosystem of data silos and platforms allowing digital enterprises to gather, orchestrate and syndicate data and insights anywhere at any time. The best practices, skills and technologies needed to power master data, are the foundational skills to scale the broader investment in information and analytic architecture. Michele Goetz, Principal Analyst at Forrester Research, will share how digital transformation is shaping MDM and how businesses are rethinking their MDM strategies for competitive advantage. Digital leaders continue to ask the question – How much product information do I need to provide for eCommerce delivery? In today’s customer obsessed digital universe with information overload, the answer is not obvious. Join us for an overview of how product data impacts the digital customer experience in retail eCommerce and omnichannel environments. Learn about the importance of product data and upcoming advances in mediums that will change the shape of product information. Master Data Management (MDM) and Business Process Management (BPM) are two significant investments that enterprises usually undertake to realize tangible business benefits by streamlining business processes and leveraging data as an asset. Wouldn't it be great if both these programs can align on people (stakeholders), processes, and technologies so MDM-enabled processes become simpler? Yes, it is possible by focusing on Data Governance and stewardship for the benefit of MDM and BPM. This webinar will cover basic aspects of MDM and BPM, potential conflicts in implementing both, and identify possible solutions to align BPM and MDM. The webinar will also cover how data governance and stewardship can play a pivotal role in facilitating the implementation of BPM and MDM. Today, there's a race around who owns the customer relationship, and branded manufacturers are getting into the game. Many branded manufacturers have been aggressively pursuing the channel of selling directly to customers in addition to traditional partner channels. This shift represents not only a huge business strategy shift for manufacturers but also a significant shift in technology. Manufacturers must consider not just their B2B, but also their B2C eCommerce investments. Gene Leganza,VP, Forrester Research and Omer Farooque, VP, Product Strategy Riversand Technology Inc. In this webinar guest speaker Gene Leganza, Forrester Research and Omer Farooque, Riversand Technologies will present the case for evolution of MDM, the characteristics of what next generation MDM (MDM 2.0) needs to look like and discuss why capabilities segments like context, graph and insight are critical for MDM initiatives to succeed in the digital age. A PIM Data Hub enables centralization of all UDI product information from various systems, creating a single view of product information. Having a centralized place to manage and govern UDI data ensures you can manage continually changing data which is critical to UDI compliance. To learn more about UDI compliance and how MDM / PIM can help, replay our webinar below. Compliance issues can impact organizations in many ways. For medical device companies, this can be in the form of the FDA's Unique Device Identification (UDI) requirements. These requirements, a result of the passage of The FDA Amendments Act of 2007, stipulate that most medical devices carry a UDI. This webinar is targeted at medical device companies who are required to comply. Master data refers to the significant entities of the organization where there is considerable interest in and potential controversy over the build of an enterprise view. Many companies today are codifying efforts to focus on master sets for customer, product, supplier, and other subjects. The value of all data goes up exponentially when it can be coupled with corporate master data and MDM is one of the best means to compound the value of any data, including big data. Learn about the major facets of MDM and how MDM is fundamental support for big data and the many other components of the emerging information ecosystem which includes many ways to manage information. This webinar is recommended for shops in learning, justifying and measuring modes with MDM. The framework and resultant mindshift will help you appropriately champion MDM and get it moving to the benefit of the organization. As data management in all its forms continues to feature high on business agendas, more and more enterprises are realizing the inherent value that exists in data, and are taking steps to leverage that value. In case you missed the original live presentation, you are warmly invited to view the recorded webinar with Andy Hayler, Co-Founder and CEO of the Information Difference and an established data management authority as he explains the extent to which the adoption of Master Data Management (MDM) has progressed in the past five years. Recent surveys of the Information Technology market have suggested an overall increase in expenditure in 2015. Join this webinar to learn what proportion of this increase has been in the area of master data management, how much companies are spending on MDM, how successful they have been and how many source systems they are connecting to. Volumes of data are growing exponentially on a daily basis, making it harder than ever to be sure that data is accurate, up-to-date and reliable for business decision-making. MDM is not a new concept, but it has become a fundamental foundation of a robust data strategy, at a time when certainty of data process, data consistency and data quality has seldom been more important. The webinar will also feature a presentation of some real-world case studies by leading MDM solution providers, Riversand Technologies. Learn how organisations similar to yours have delivered successful MDM deployments and the business drivers involved. Riversand is an innovative leader in Multi-domain MDM and PIM powering leading enterprises across the world. Riversand's single integrated, scalable and robust multi-domain MDM platform caters to a variety of use cases across multiple verticals. In addition Riversand offers specific solutions such as Vendor Portal, Spare Parts Management, Material Master, GDSN on-boarding, Media Assets Management, Print Publishing etc. Riversand’s solutions enables its customers by accelerating time-to-market, improving efficiency and increasing customer engagement.